Facing allegations of soliciting prostitution, among other charges, Chief Judge Edward Nottingham of the District of Colorado has resigned from the federal bench. The resignation moots his judicial misconduct inquiry, at least according to the Judicial Council of the Tenth Circuit. To read the order dismissing same, click here (summarizing the judicial conduct complaints and investigation). The situation strikingly seems to mirror the very recent fate of Eliot Spitzer: Both opted to resign. Soliciting prostitution, of course, would violate Canon 2A (failing to comply with the law), now Rule 1.1, and (almost surely) would create an appearance of impropriety. That said, we would have to agree that resigning from such awe-inspiring positions — Chief District Judge of Colorado and Governor of New York, respectively — (self-)imposed a significant sanction on both Nottingham and Spitzer. The question, then, is whether that sanction is too lenient, too draconian, or roughly proportionate for their crimes. The Brennan Center for Justice recently issued a fine paper on recusal standards, particularly in light of Republican Party of Minnesota v. White, 536 U.S. 765 (2002). The paper (among other features) offers ten specific proposals, including peremptory disqualification, enhanced disclosure, and like the ABA, mandatory disqualification whenever a party appearing before the judge has contributed significantly to the judge’s campaign. See Model Code of Judicial Conduct R. 2.11(A)(4)(2007). Click here to review a copy, courtesy of the Center. Equally of interest, the (relatively) new Judicial Disqualification Project of the ABA Standing Committee on Judicial Independence has released an eighty-six page draft report, which thoroughly explores the history of disqualification and its current problems. Professor Charles Geyh at IU – Bloomington, no stranger to judicial ethics, is the director of the project. To review the draft report, click here. While it has been nearly twenty years since the last federal judge was fully impeached, the two-decades-long (nearly) unblemished record may be shattered soon. District Judge Thomas Porteous (E.D. La.) has been publicly censured for (among other accusations) soliciting money from attorneys appearing before him and filing false financial disclosure forms. To read the Judicial Council of the Fifth Circuit’s underlying Order and Public Reprimand, click here (citing violations of 28 U.S.C. § 455 and Canons 1, 2A, 3C(1), 3D, 5C(1), (4), and (6) of the Code of Conduct for United States Judges). The Council even opines that Judge Porteous committed several federal crimes (such as honest-services mail fraud), in addition to the ethical violations. The House Judiciary Committee has just formed a task force to consider the nuclear impeachment option. This is big. The last federal judge impeached was former District Judge Alcee Hastings (S.D. Fla.) for allegedly accepting a bribe for lenient sentencing and then committing perjury. Mr. Hastings then became a Congressman. At least one nagging question: If the reports are accurate that Judge Porteous has twice offered to retire in light of his struggles, is impeachment necessary? To deter other federal judges from committing felonies? To punish or judicially incapacitate the Judge? Would not retirement plus criminal prosecution (if warranted) be sufficient? Judicial ethics is a curiously under-, and in many ways un-, explored field. It could not be more important, however. On its most important level (perhaps arguably), compare Brown v. Board of Education (good? ), with Korematsu v. United States (evil?). Compare as well Buck v. Bell (Holmes, J.) (upholding forced sterilization law on the basis of its perceived—now debunked—societal good), with Lawrence v. Texas. Granted, judicial ethics is more commonly thought of by the more (seemingly) mundane rules embodied in (more or less from state to state) the Model Codes of Judicial Conduct, but these too are fascinating. Take, as one randomly picked illustration, the judge who, during a death penalty case, allegedly engaged in an undisclosed romantic relationship with the prosecutor, yet the defendant, Charles Hood, received the death penalty. There is more. Judicial ethics is inextricably tied to enforcement, namely, judicial discipline, and equally tied to the propriety to sit, judicial disqualification/recusal. 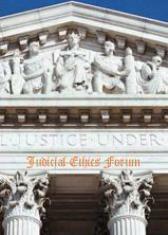 This Forum, the first of its kind, takes on all three subjects — judicial ethics, discipline, and disqualification. Fortunately, judicial ethics offers us much room in which to disagree, respectfully of course. These disagreements can range from the seemingly trivial (e.g., stock ownership) to the seemingly world-changing (e.g., Bush v. Gore). Let’s discuss.